A new online collection of protest songs, as the G8 summit approaches, marks the star's biggest gift to music since U2. 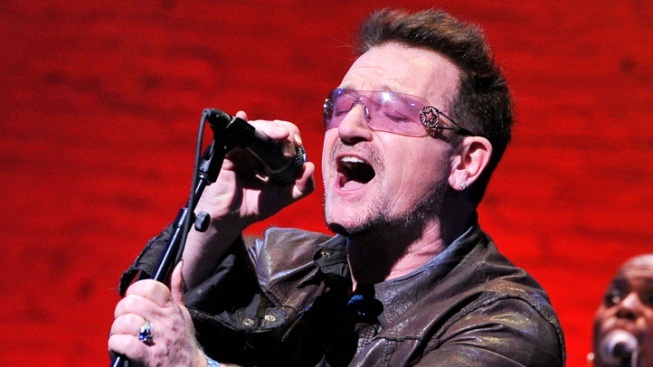 Bono's new effort is a collection of protest songs by various artists. Bob Dylan's radical reworking of "Masters of War" at the 1991 Grammys split fans between those who declared the performance a bold success and others who derided it as a muddled mess. If the verdict was unclear, that was nothing compared with the words, which were largely incomprehensible – blunting the impact of Dylan’s Cold War protest song, revived on live TV during the Gulf War. Unless you had a copy of 1963's "The Freewheelin' Bob Dylan," there was no way to quickly check out the far-sharper original in those pre-Internet, pre-iTunes days. Dylan's polarizing performance came to mind this week with the debut of Ed Sheeran's strong take on the angry anti-war anthem, still relevant a half-century later. Sheeran's Dylan tribute is among some 60 protest songs – originals and covers – archived so far on a new site assembled by Bono’s anti-poverty ONE Campaign ahead of next week's G8 summit in Northern Ireland. Outside of his own U2 catalogue, Bono’s new agit8 movement stands as perhaps his biggest gift to music yet. The site offers annotated histories of the songs, and allows users to filter by protest subsets – anti-war and women’s rights, among other categories. ONE’s YouTube channel also offers various artists’ takes on protest songs (check out Daby Touré’s version of John Lennon’s NSFW “Working Classing Hero”). Bono’s latest campaign follows last year’s centennial celebration of Woody Guthrie, the granddaddy of the modern protest song. Guthrie’s legacy reminds us that no matter where you fall politically, there can be undeniable power in music, even if sometimes the words get lost. “He's an intense guy, isn't he?" Sheeran says of Dylan after finishing his sparse, but effective rendition.